If you have an injured or misshapen tooth, all of these issues can be easily corrected with a dental crown. It is a tooth-shaped restoration that fits over the top of a natural tooth. With it, we can restore a tooth’s appearance and function in as little as two appointments. 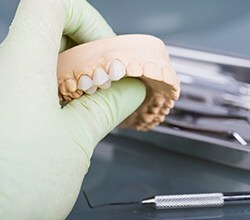 If you are missing multiple teeth in a row, two dental crowns placed on the teeth on either side of the missing ones can be attached to a fake tooth to literally “bridge” the gap. With a dental bridge, Dr. Bruno can restore a patients’ ability to eat and speak normally as well as ensure that their remaining teeth don’t shift into the open space (which often happens). Whether you have a damaged tooth or are missing one entirely, Dr. Bruno and our team have just the solution you need. To learn more about these restorative treatments or make an appointment, contact us today.